Beer Bridge Road Brewers Yee Hah! Always on the lookout for new ideas, it was while touring the States that Bridge Road Brewers founder Ben Kraus became enamoured with the idea of installing a foeder at his Beechworth home. These are large oak vessels, most famous in the beer world thanks to Rodenbach but becoming more popular elsewhere. While Rodenbach ages its base beer for up to three years in its 294 giant foeders before (usually) blending with younger beer, in the States Ben saw many brewers simply using them as an extra fermentation vessel to create another line of beers. So he bought one earlier this year and set about creating the Mayday Hills range – which you can read about here. 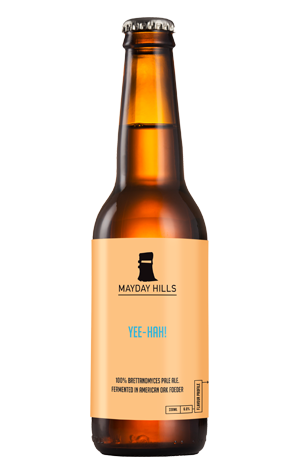 The first beer to come out of the foeder is Yee Hah!, a 100 percent Brettanomyces fermented pale ale, Brett being a yeast strain often referred to as "wild" but these days available tamed in pitchable, off the shelf form too. While some strains when used with certain brewing techniques can lead the yeast to create funky "barnyard" or "wet hay" characters, here the intention was to allow the little creatures to contribute fruity characters as well as a fuller body. Two batches were brewed: one for kegs and one for bottles. Both are hazy, light golden affairs and you notice instantly that they've been heavily late hopped too, emitting big fruity aromas. But, according to the brewing team, much of those apricot and pineapple aromas and flavours were there even before the late hops were added. The new oak adds a creamy vanilla character, although supporting rather than dominant, in what's a highly promising start for the range. An IPA with various locally sourced added ingredients is already developing for beer two, all of which will only be fermented with Brettanomyces.